This level has medium difficulty. 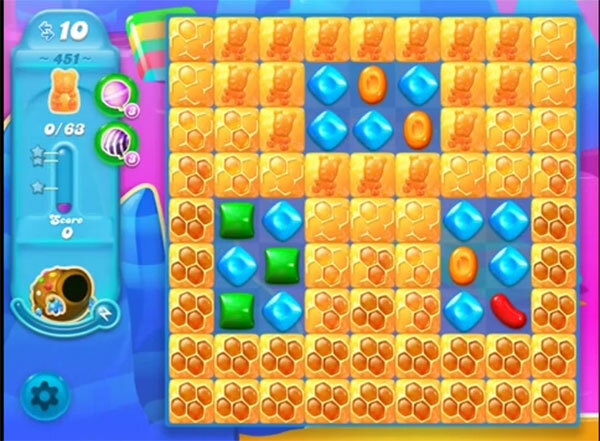 For this level try to play from one side and as you have more candies available to play then try to make special candy. Combine special candies with each other to break more honey blockers to save the bears. Or play near to honey blockers to break them all to save all bears. Got 33 bears that’s as close as I can get no way to complete this level with only 10 moves when the special candies start coming down I am out of moves NEED HELP PlEASE CANNOT COMPLETE THIS LEVEL. This level is impossible! Can’t get past 30 bears or so. It oalways looks easy on the videos. I just beat level 450 and theres a paintbrush bucket saying ‘More levels coming soon’ and won’t let me go on to 451. How long do you have to wait? I am a novice at this game but passed it after several tries.